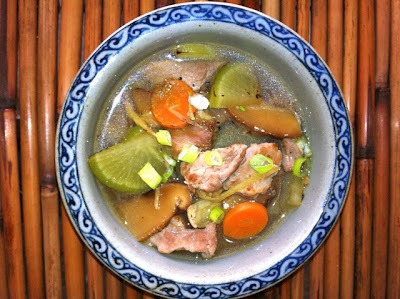 Turnip, Chinese Mushroom, Pork Soup. I had with a little red rice. 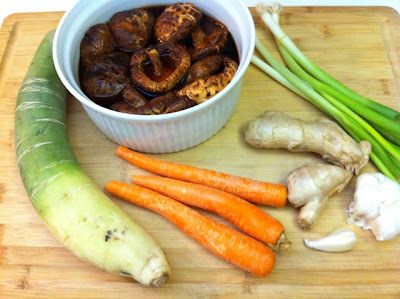 While making this Turnip, Chinese Mushroom and Pork Soup, the smells and all the tasting was such a tease! I couldn’t stop diving into it and had an early lunch! Today’s ‘thought process’ and part of Cook Like A Wok Star series was how to use the same ingredients to make a soup and also a stew! I even videotaped some of this and I’m learning how to edit and piece it together. I’ll let you know when I upload to youtube, don’t laugh at my attempt, at least I’m trying. I’m very excited to be invited to join #LetsLunch, a group of wonderful food bloggers I met through twitter! You can see my twitter feed in the sidebar. Someone thinks up a category and everyone goes off and creates a dish, take photos and writes a blog post and link to each other. Today’s liquid lunch is a tribute to @geokaren who’s had to have surgery and wasn’t able to eat solids. Keep checking back for the latest updates at the bottom of this post! 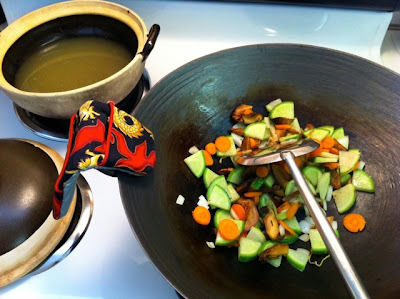 I love using my cast iron wok to stir fry my veggies and meat prior to transferring to a claypot to make soup! 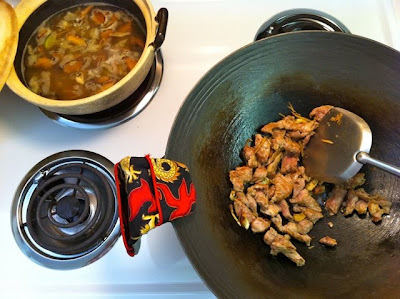 This wok is the best material for getting the veggies crunchy and also to sear the marinaded sliced pork shoulder. Because I don’t teach using ‘recipes’, this is a very rough guideline to the ingredients and seasonings I used. I’ll be using these same ingredients to make a stew right after posting this, so I hope you’ll come back for that. 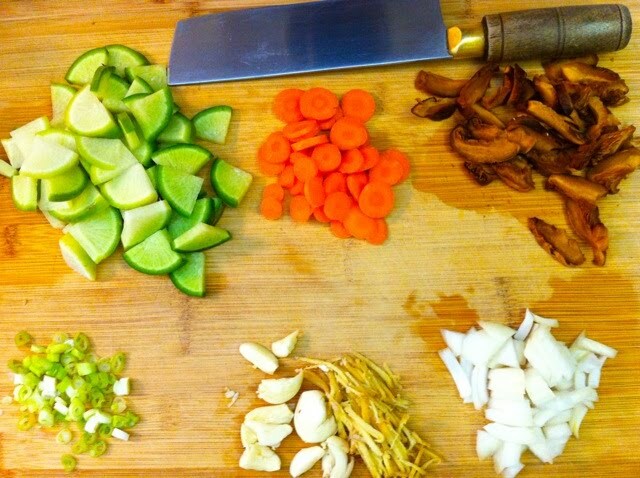 Leave chopped veggies on cutting board. I added in onions. 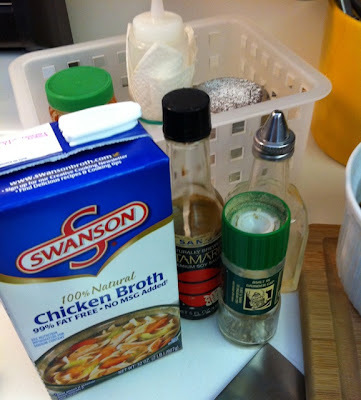 Chicken broth, tamari, sherry & pepper seasonings to flavor the soup. 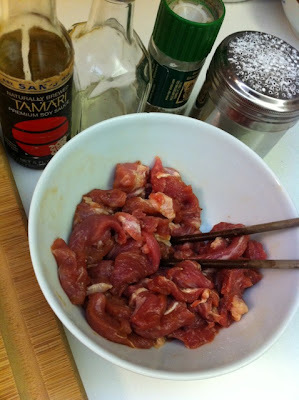 4 basic seasonings I use to marinade protein or make sauce. Stir fry veggies in my cast iron wok with a little oil, garlic, ginger. Frying your veggies first saves you a cleanup step! Stir fry pork with a little oil and garlic, ginger in my cast iron wok. 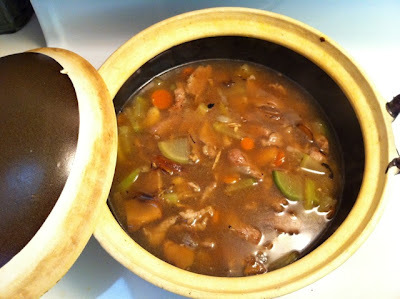 Add pork to claypot, done! Cheryl’s Miso Bacon Corn Chowder at A Tiger in the Kitchen. Congratulations to Cheryl on her recent book, A Memoir of Food and Family!